DP-K301/151/451 pneumatic airless sprayers are equipped with stainless steel fluid pump, all the web parts are made of stainless steel material. So this unit is suitable for all kinds of sealers, topcoats, primers and wiping stains, colorant, varnish, lacker, in medium to high viscosity. Ideal for wood finish / furniture painting / surface painting jobs. 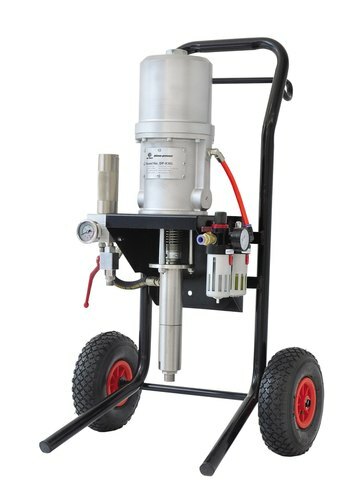 High quality pneumatic airless paint sprayer with reliable Mechanical transducer / reverser, quick action and no ice low air consumption. Provides higher efficiency & minimum maintenance, for industrial usage. Teflon + Leather V-packings will always works like new, only replace it once per year. Save you time and money on your maintenance and repairing. Small size and light weight, ideal for furniture painting, factory, steel structure, etc. Commercial or industrial painting jobs which last 12 hours every day. Equipped with air filter regulator & lubricator for easy air controlling, filtering, and lubricating. Surely prolong the machine’s lifetime and performance. The large manifold filter will always ensure you equal and nice finishing without pressure fluctuate. Meanwhile reduce the tip clogging also. The inflating pneumatic wheels for easy moving on rugged jobsite roads. The DP-151 could be produced in air-assisted airless type, attached with AA airless gun, provide perfect atomization and great finishing results, especially for furniture woodworking nice finish. Please send me a quote on the dp301.